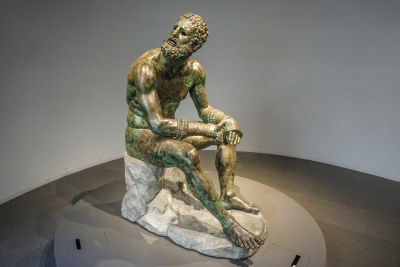 One of the greatest museums in Rome is the Palazzo Massimo Alle Terme that is one of the 4 that make up the Museo Nazionale Romano (four different locations). The collection is housed in a building that was constructed 1883–1887 and served as the headquarters of the Jesuit Collegio Massimiliano Massimo—by the baths (alle Terme)—and thus the name. Some of the most beautiful sculptures, mosaics, and paintings from Roman times are on display here.